“Face without Name” is Bayu Utomo Radjikin’s 7th solo exhibition featuring paintings and large-scale charcoal works on canvas which will be held at the Substation Gallery from June 3rd – 19th. Reception will take place on June 3rd from 19:30. 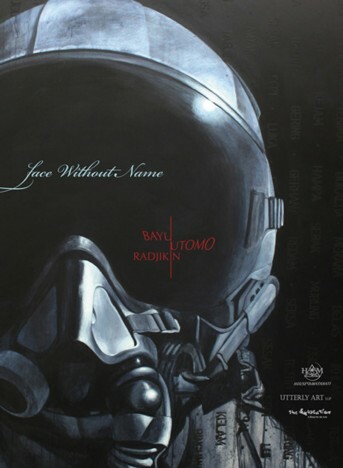 Bayu Utomo Radjikin is a recognized figurative painter in Malaysia. The works in “Face without Name”, remain true to the artist’s signature style. They are epic, large, and acutely realistic. And, the total showing is a miscellany of both charcoal works and paintings. The physiognomic features of the artist’s signature male figures (alternately himself and a fellow artist) are detailed and pronounced, as are the attributes on the fighter pilot helmets. Both figures – masked and unmasked – are portrayed with a strong sense of drama made possible by the strong shadows and deep contrasts, which lend an air of nobility and importance to his subjects.